According to leaked benchmarks, Amazon’s Kindle Fire HD 2 could be a Nexus 7 killer. Google recently dropped a popular new tablet in the form of a revamped Nexus 7. Leaked benchmarks also point to a new Kindle Fire HD in the works. Which of these small, Android-powered tablets will reign supreme this holiday season? The Nexus 7 (2013) is the only one of these three slates to be available now. It was released on July 30 for $229 (16GB model). It is 7.9 inches high, 4.5 inches wide, and 0.3 inches thick – weighing in at only 0.69 pounds. It has a 7-inch LCD display with a resolution of 1920 x 1200 pixels at 323 PPI. Beneath the screen is a 1.5GHz Qualcomm Snapdragon S4 processor. The new Nexus 7 offers 2GB of RAM and either 16 or 32GB of internal storage. There is also a 5MP rear-facing camera with a 1.2MP camera on the front. Google’s new tablet, made by Asus, runs stock Android Jelly Bean 4.3 straight out of the box. It can connect to the internet via Wi-Fi or LTE with a claimed usage time of 10 hours. According to newly surfaced rumors, Amazon’s next Kindle Fire HD will receive a generous boost in specs over last year’s model. IBTimes reported that leaked benchmarks, provided by GFXBench, will put the Kindle Fire HD 2 ahead of the Nexus 7 as far as processing power – while matching the 7-inch slate’s screen resolution. 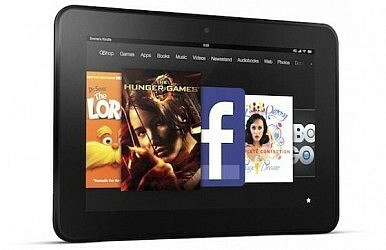 Last year’s Kindle Fire HD was announced by Amazon on September 7. It is likely that the web shopping giant will announce its successor around the same time this year, just in time for the holidays. The 7-inch Kindle Fire HD in the leaked test results was reported as running Android Jelly Bean 4.2.2 – “but the company is expected to continue using a forked version of the mobile operating system that does not allow access to the Google Play store,” added IBTimes. BGR also stated that the new small-sized Kindle Fire HD will come with three different storage options – in the vein of Apple’s iPhones and iPads – with 16, 32, and 64GB models offered. If the rumors pan out, consumers may be faced with a tough choice when deciding on a high-tech holiday gift. The Nexus 7 offers more versatility and promises the fastest straight-from-the-source updates – but a Snapdragon 800-powered Kindle Fire HD might prove attractive to heavy content consumers. Unless Apple releases a Retina iPad Mini before the end of the year, Android-powered tablets could gain even more ground in the battle against iOS – iPads still account for 32 percent of all tablets sold, slipping from 60 percent a year ago. Two new hi-res tablets made for two kinds of users: Which is for you?